When I tour with folks at Regency Park Nursing & Rehab, I tell them that we are not here to simply facilitate the ‘survival’ of our residents. There isn’t a resident here who is simply passing time and “surviving.” Rather, everyone who is here is absolutely thriving! One need only witness the happy and smiling faces of our residents (and their families) to see the kind of compassionate care we provide. There are far too many nursing homes who adopt the “survival method” approach, whereby they engage in ‘routine maintenance’ of the residents who fall under their care. There is no passion invested in their work and there isn’t a desire to build up the emotional and psychological wellbeing of their residents, in addition to looking after their physical needs. Regency nursing centers offers a diverse range of programs geared towards stimulating and cultivating the total wellbeing of our patients and residents. As a result of our overarching commitment to create happy residents, we have built a recreation program that is first rate and unrivaled by any of our competitors. Each and every day is chock full of activities and our residents are constantly busy, active and happy! Whether it is our many interactive games, bingo sessions, concerts (Elvis didn’t die, he is in our building all of the time!) or our arts and crafts, there is something for everyone! In fact, right outside my office there is a huge calendar of activities posted on the wall. See the picture below. 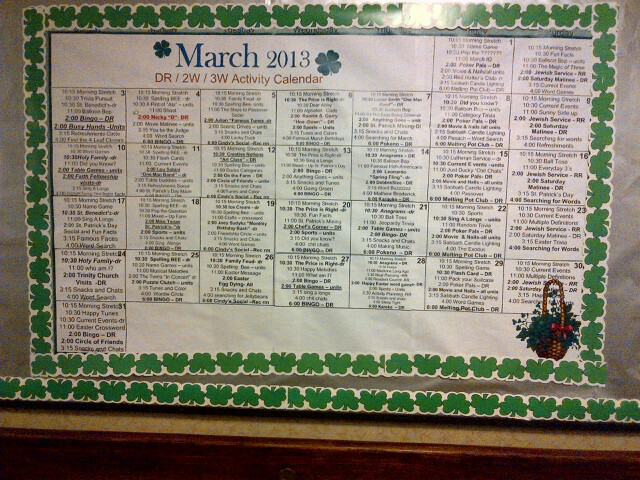 Every resident has a small version of this calendar in their private rooms. Some of the activities are self explanatory, while others are completely foreign to me. I do know that our Recreation Director, Maribel Restrepo, invests a great deal of effort and talent into making every activity a unique success! The Regency Park Activity Calendar! I invite you to tour with us at Regency Park in Hazlet, New Jersey, to see what all of the buzz is about! Please call me at 732-264-5800 extension 3343. This entry was posted in HealthCare News, Regency Staff Spotlight, Senior Care and tagged best nursing homes in new jersey, regency nursing, regency park, regency park nursing, top new jersey rehab centers, top new jersey rehabilitation facilities, top nj nursing homes, top nj rehab center. Bookmark the permalink.